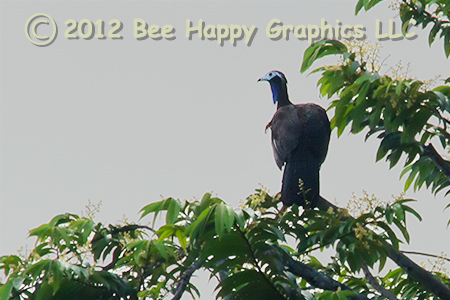 This piping guan is endemic to Trinidad and is critically endangered, with between 100 and 200 remaining, due to overhunting. Locally, they are known as pawi. They are large, like turkeys, being almost 24" high and are arboreal, meaning they live mostly in trees. This photograph was taken while on a Tropical Audubon Society birding trip to Trinidad and Tobago led by Brian Rapoza. The bird was about 90 yards away, requiring Nancy's longest lens with a 1.4x extender (and extensive cropping). Photographic details: Canon EOS 7D camera w/ EF 100-400mm f/4.5-5.6L IS USM lens and EF 1.4x II extender set at 560mm. Flash was not used. Camera was on f/11 for 1/500 sec at ISO 800. Fine Art Paper N/A 6" x 9"
Canvas N/A 81/2" x 13"
Although we can print to your specifications any size up to the above limits to the nearest 1/16" with any mat and moulding combinations, we presently have none of these in stock.